One of the reasons I started a blog was to enter challenges. I really am addicted to them and love that they make me try different layouts, styles and embellishments. One embellishment I don’t use very often is chipboard. In fact it took me ages to find some in my mess of a craft room. Quite a few years ago I went to a craft show and fell in love with an Australian craft company called Collections Elements. It suited my vintagey style so I stocked up on papers, chipboard and old cotton reels. I then got addicted to Stampin’ Up! and used none of the Collections Elements products that I’d spent a couple of hundred dollars on! But I REALLY had to have them! My butterflies are chipboard that I punched with my butterfly punches (I wouldn’t recommend doing that too many times with your SU! punches!). I then whipped them through my big shot with the Vintage Wallpaper embossing folder to give them texture. Lots of distressing, sponging and scrunching and my tag was done. We’d love for you to join us in this weeks chipboard challenge – so head over to the challenge and link up a project. 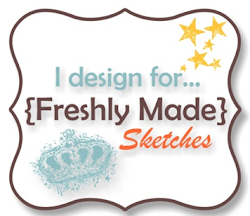 While you’re there, check out the fabulous inspiration from the Design Team. 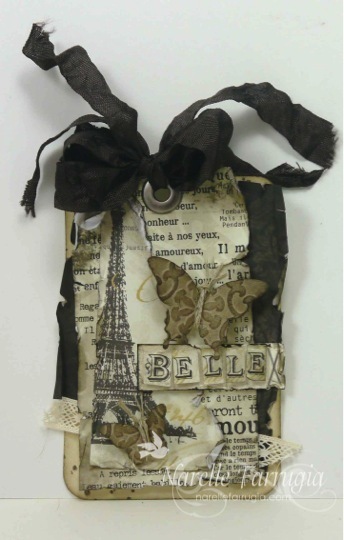 Love love love it ,can we do a class in this style of distressing ? This is beautiful Narelle. You and grungy-vintage-with-chipboard are a match made in heaven! Gorgeous! The little bit of crochet ribbon peeking out the bottom is a great touch! This tag is amazing… like stop me in my tracks amazing!